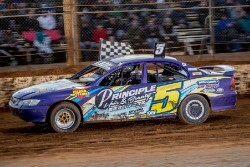 One of the biggest fields of Modified Sedans in recent years has entered for the opening night of the season at the Cranes Combined Carrick Speedway, headed by State Champion, Brad Herbert. The racing is sure to be hotly contested with five times State Champion, Andy Russell, Luke Williams, Trent Quillerat and Josh Marston all joining Herbert in the line-up. Eyes will also be on Jakobe Jetson who makes his senior debut, having impressed in recent practice events, after dominating Junior Sedan racing last season where he won fifteen feature races. Racing commences at 5.00pm EDST, with events also scheduled for Junior Sedans and Street Stock.